Symptoms of EoE may vary from one individual to the next and may differ depending on age. Infants and toddlers often refuse their food or have trouble growing properly. School-age children may have recurring abdominal pain, trouble swallowing, or vomiting. Adolescents and adults most often have difficult or painful swallowing. 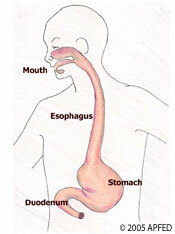 Their esophagus may narrow and cause food to become stuck (impaction), causing a medical emergency. Symptoms also may vary given the developmental ability and communication skills of the age group affected. While the exact cause of EoE is not yet known, the general belief is that it’s typically caused by an immune response to specific foods. Many patients with EoE have food or environmental allergies. Researchers have identified a number of genes that play a role in EoE, including a recently discovered gene, calpain14 (CAPN14), that is expressed primarily in the esophagus. These pathways may provide new direction to diagnose, monitor and treat EoE in the future. EoE is a newly recognized disease that is now increasingly diagnosed in children and adults. 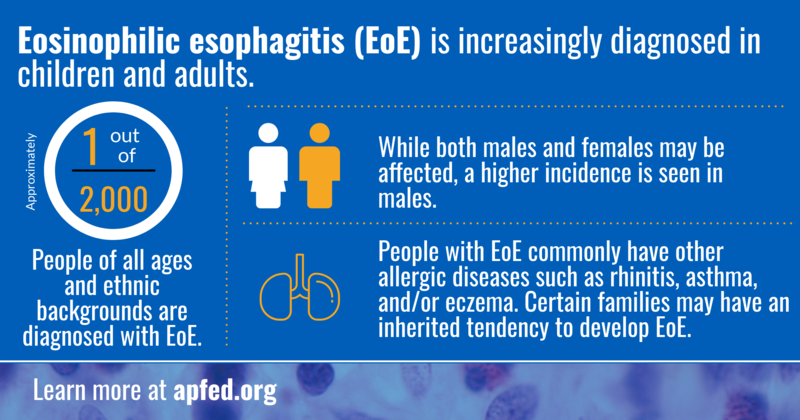 Eosinophilic esophagitis is a rare disease, but increasing in prevalence with an estimated 1 out of 2,000 people affected. EoE affects people of all ages and ethnic backgrounds. While both males and females may be affected, a higher incidence is seen in males. People with EoE commonly have other allergic diseases such as rhinitis, asthma, and/or eczema. Certain families may have an inherited tendency to develop EoE. A gastroenterologist must evaluate a patient for the symptoms consistent with eosinophilic esophagitis, taking a careful history. Since EoE can mimic other conditions, more common diseases such as gastroesophageal reflux disease (GERD) must first be ruled out. A doctor will perform an upper endoscopy. During this procedure, the patient is sedated or put under anesthesia, and a small tube called an endoscope is inserted through the mouth. The esophagus, stomach, and the first part of the small intestine are examined for tissue injury, inflammation and thickening of the esophageal wall. Small tissue samples are taken (biopsy). This procedure is typically not uncomfortable and may be done on an outpatient basis. A pathologist will analyze the tissue samples under a high-powered microscope to see the small cell structures. If eosinophils are present in the sample, the pathologist will count how many are visible. A count of 15 or more eosinophils per high-powered microscopic field warrants a diagnosis of EoE. 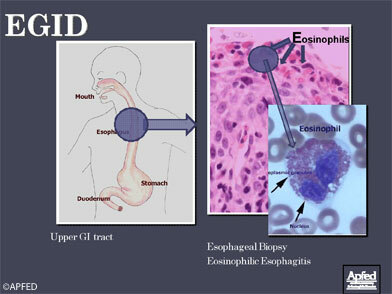 A patient may have EoE even if the esophagus looks normal during the endoscopy. The biopsies will help in making an accurate diagnosis. Endoscopy with the biopsies is the only reliable method of diagnosing EoE at this time, although promising research for less invasive diagnostic and monitoring is currently underway. The two main treatments recommended for EoE are diet management and medication. Targeted Elimination Diets- Foods that test positive on allergy testing or history are removed from the diet. Empiric Six-food Elimination Diet- This type of diet has shown success in some patients. Instead of basing dietary elimination on allergy testing results, patients eliminate common allergy-causing foods (milk, eggs, wheat, soy, peanuts/tree nuts, fish/shellfish). Elemental diet – All sources of protein are removed from the diet and the patient drinks only an amino acid formula. Sometimes, a feeding tube may be required. Food trial – Specific foods are removed from the diet, and then added back, one at a time, to determine which food(s) cause a reaction. Diet management involves repeat endoscopies with biopsies as foods are reintroduced to determine which foods are tolerated. Topical steroids – There are currently no FDA approved medicines available for the treatment of EoE. However, doctors have found that topical steroids are often successful in putting EoE into remission. Topical steroids (fluticasone or budesonide) are swallowed from an asthma inhaler or mixture to control inflammation and suppress the eosinophils. Systemic corticosteroids such as Prednisone are not used for chronic management of the disorder, but may be prescribed for acute situations and short periods of time. Acid suppressors – May also help relieve reflux symptoms in some patients in combination with dietary therapy or medications. In some situations, both medications and dietary therapy may be used together. 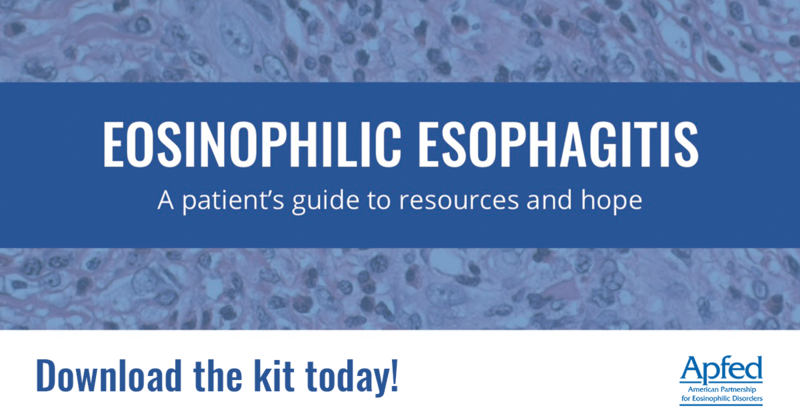 Eosinophilic esophagitis is a chronic disease that requires ongoing monitoring and management. EoE does not appear to limit life expectancy and there is currently no strong data suggesting EoE causes cancer of the esophagus. In some patients, EoE is complicated by the development of esophageal narrowing (strictures) which may cause food to lodge in the esophagus (impaction). It can also make eating very difficult and uncomfortable for children and adults. It is not clear how long EoE has to exist before strictures form. However, since the natural history of EoE is only emerging, careful monitoring and long-term follow-up is advised. The initial diagnosis of EoE can be overwhelming and often affects the entire family. A positive attitude and a focus on non-food activities go a long way in learning to live with EoE. With proper treatment, individuals with EoE can lead a normal life. 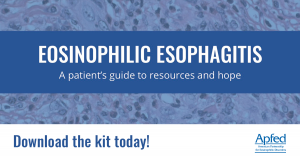 APFED EoE Patient Education Kit (PDF) – A great primer for those with a new diagnosis! EoE- How do we diagnose? © American Partnership for Eosinophilic Disorders (APFED) 2006-2019, All rights reserved. Content may not be reproduced in whole or in part without express written consent from APFED.